Nowadays, there are a lot of cars on the roads. Many people prefer bikes to cars as a way of transportation. It is good for your health, saves energy and protect environment. There are several types of bikes, hundreds brands and designs, but we are still missing something. The more bikes the less space for parking them. What to do? Sada Bicycle is the answer! The inventor Gianluca Sada came up with this idea after being disappointed by current folding bicycle designs. 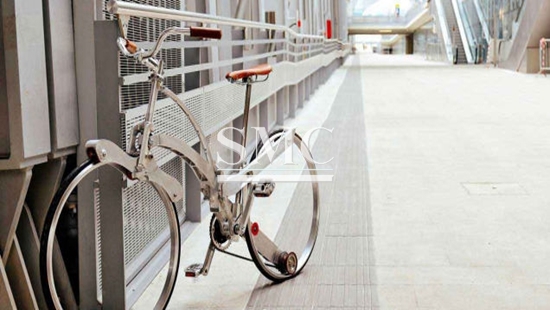 His bicycle still has standard bicycle dimensions - 26 inches wheels, but the hub-less design means, that as the frame folds away, it comes apart from the wheels and that maximizes portability. 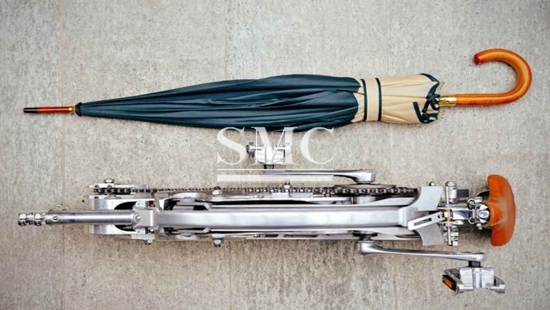 The packaging container can be used as a backpack and the whole bicycle can be folded with a single movement to the size of an umbrella. This design mostly focuses on saving space. Bicycle wheels typically get strength from the tension in the spokes, but this bike put strength into rim instead. This adds weight to the outside of the wheel and then you have to get this mass spinning. As this design is considered to be a city bike design, it wouldn't be such a problem. The bikes have been currently tested in the cities all over the world. The inventor is hoping that he will develop this idea to the bike that combines light-weight and high performance.